Just like anywhere you travel for vacation or adventure, you can spend money lavishly or frugally, but Easter Island’s reputation comes with a hefty price tag. Due to the remoteness of Easter Island (smack center in the Pacific Ocean with its nearest neighbor located ~2000 km away), it is clear why things cost so much. But with proper planning, budgeting, frugal decisions, and maybe a bit of luck (which I will later explain), it is actually not as expensive as one may think to travel to and explore one of the most remote places in the world. Assuming you don’t blow all your money on tours, accommodation, meals, and souvenirs, perhaps the biggest expense of the trip to Easter Island is the plane ticket. During the high season of December through February (summer) tickets book up fast, even with the inflated price of $800! I booked tickets for the end of April (autumn, low season) 2 months in advance for $530…business class. For some reason, business class tickets were actually cheaper than economy seats at the time of purchasing, so I just lucked out there. However, a friend of mine purchased his ticket a month in advance for as low as $510, and I met a guy who purchased his ticket just a week before coming to Easter Island and he only paid $520. Assume the cheapest ticket you can pay for is ~$550 in the low season. 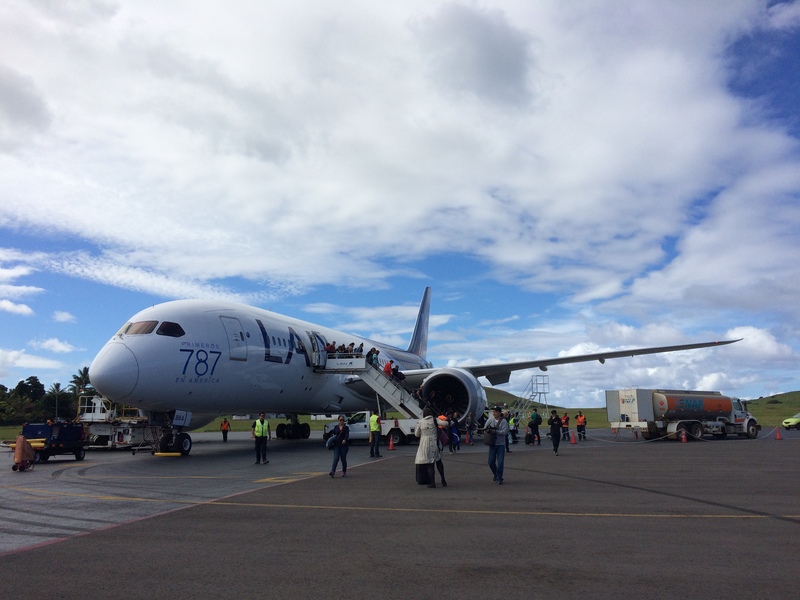 The flight to Easter Island from Santiago will be on the 787, the newest, biggest, and most badass plane out there. 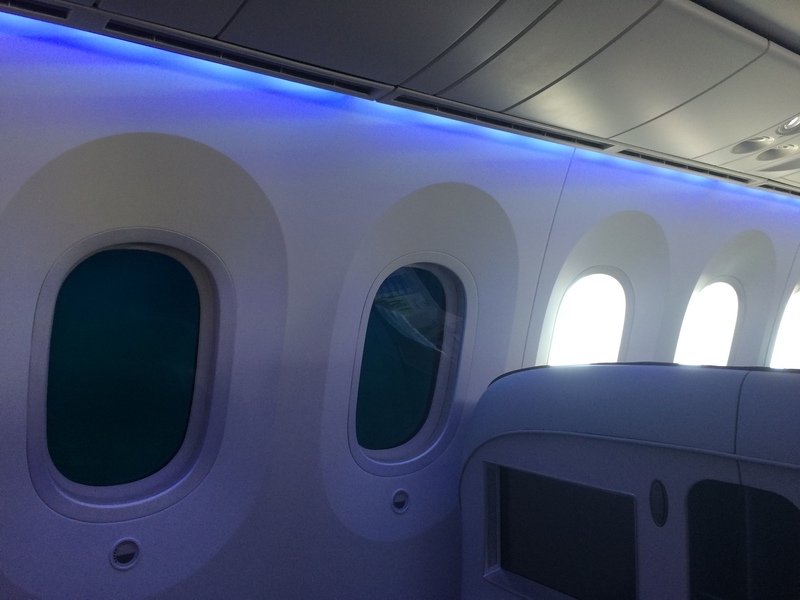 Tip: Try to sit on the left side of the plane. 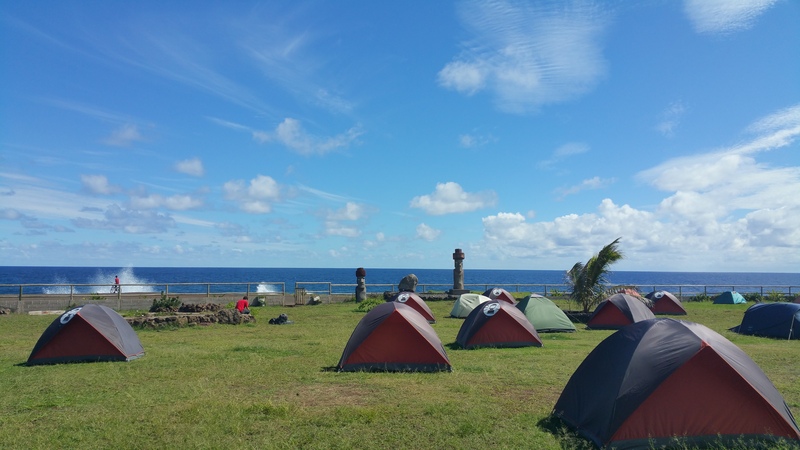 There are all sorts of accommodation in Hanga Roa, the “downtown” of Easter Island. From luxury resorts, to bed and breakfasts, to hotels, and to camping, Easter Island has it all. I even saw some homes advertising a CAMPING sign on their fence, welcoming any strangers to camp on their lawn for a fee. We opted for 3 nights of camping and 2 nights at a hostel/hotel. Because we needed to rent sleeping bags and a tent we camped with Camping Mihinoa on the beach for 5,500 ($8.40) pesos per person per night. It was an additional 2,000 pesos (~$3) per tent for wifi and use of electricity. In total, we spent 35,000 pesos (~$54) for 2 people for 4 days and 3 nights at Camping Mihinoa. I figured we’d enjoy a bit more comfort and privacy toward the end of our trip, so I found a charming place on AirBnB for $60/night. Our room accommodated three people, and Chris and I split the room with our friend, bringing the price down to $20 per person per night. Brief research online showed that the cheapest private rooms can be as low as $40 per night, but they all get booked in advance. When I booked 2 months in advance, the cheapest rooms were already filled. Average rooms seem to range from $60-$100. Thanks to camping and splitting a room from AirBnB with 2 others, my cost of accommodation for 5 nights was $67. Had we camped all 5 nights the cost of lodging would have been even cheaper. Food on the island isn’t cheap, not even from the grocery store. Everything is hauled in overseas. Entrees in restaurants range from 10,000-20,000 pesos ($15-$30)! 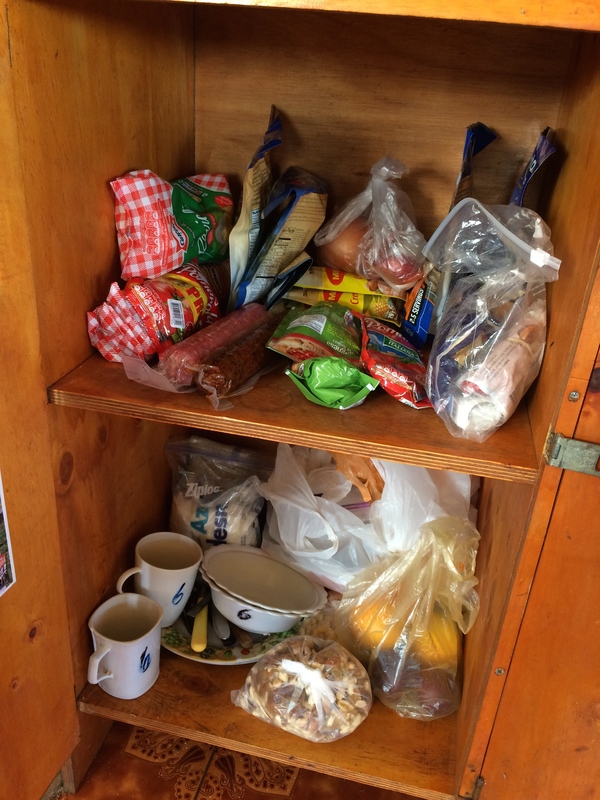 In planning our trip to Easter Island I made sure to stock up on groceries at Mercado La Vega in Santiago (the best and cheapest place for produce), and made sure our campground and hotel had a kitchen. Chris and I each carried a heavy bag of groceries from Santiago to Easter Island, and my goal was to finish all of it before heading back. It cost about $20 for food that would feed Chris, me, and a friend 4 dinners 5 lunches. Not too shabby! Easter Island is known for its seafood, so I wanted to enjoy a meal at a restaurant for our last night. The three of us split an entrée, soup, appetizer, fries, and some beers for $27 USD each. I was glad I splurged for only one night of eating out considering how expensive food was. We also budgeted for the occasional cold beverage, water, snacks, and yogurt (about $20). Bringing in our own food and using the available kitchens made our cost of food incredibly low. Over the course of 5 days, the cost of groceries brought in from Santiago, snacks and beverages on Easter Island, and one night of eating out was $67. 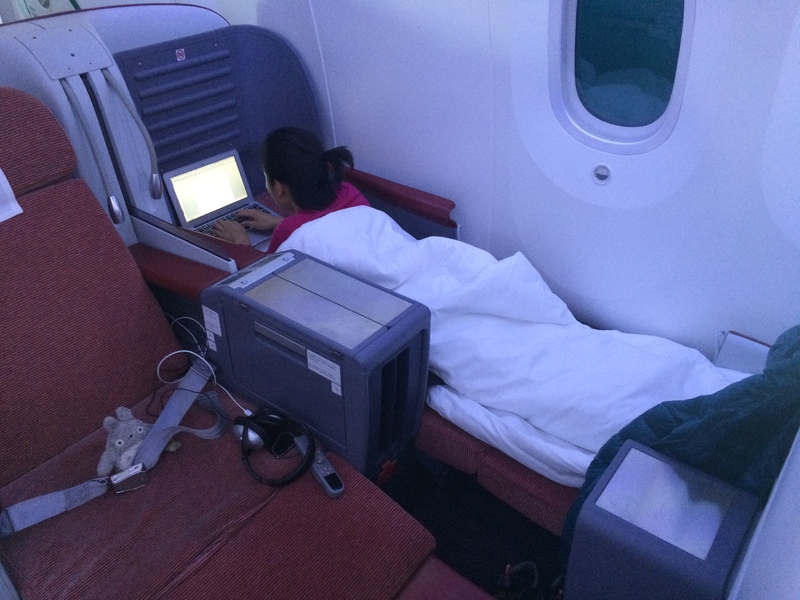 I lucked out with cheap business class tickets, but I lucked out even more upon arrival. It is said that everyone must purchase a national park ticket for 30,000 CLP (~$45) that can be purchased at the airport. After arriving I inquired about where to purchase the park fee, but apparently there had been some dispute with the Chilean government, and tickets were not required to enter the park at that time. Further inquiry revealed that this had been ongoing for most of April and will continue into early May. 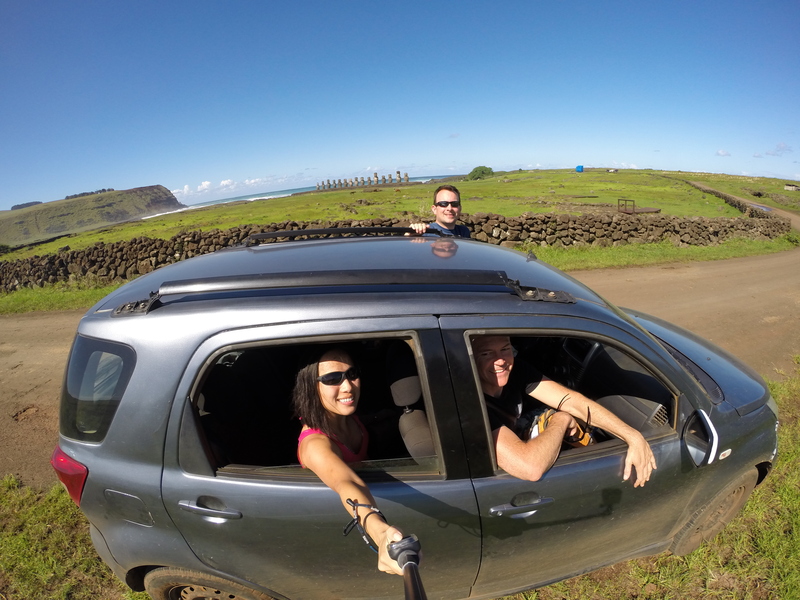 Free entry into the Easter Island national parks? Romping and Nguyening! As I do all my travels, I enjoyed Easter Island without any tours. Tours not only prohibit freedom, but are also expensive. Out of curiosity I looked up tours online and saw that packaged tours can cost as much as $200-$400 pp! Insane! For our first two days, each of us rented bicycles for 16,000 pesos (~$25). (The price was 10,000 pesos (~$15) for one day, and each additional day was cheaper.) The longest stretch of road from one end of the island to the other is only 24 km, so a round-trip ride is completely doable. 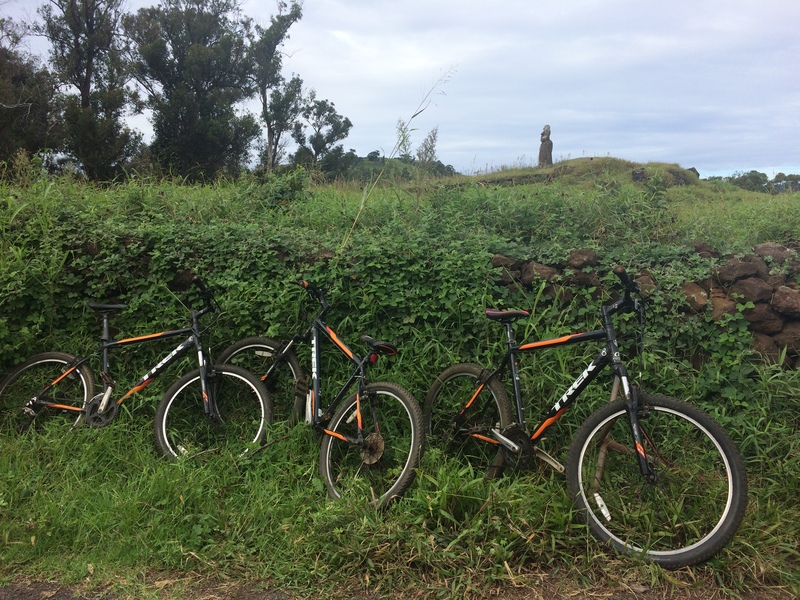 With a reasonable level of fitness and expectation of the road conditions and weather, exploring Easter Island by bicycle is not difficult. In fact I found it the most adventurous and rewarding way to see the island. There was wind, rain, tree roots, rocks, potholes, steep hills, and fun descents, but we loved it. We also rented a car from Camping Mihinoa for a day for only 30,000 pesos (~$45). It seems as if most hotels/campgrounds offer car, bike, and motorbike services of their own that are much cheaper than the ones offered in the city. The cost of the rental car was the same price as renting 3 bikes, but we preferred biking over driving. Between the three of us, the cost of the rental car was 10,000 pesos (~$15) each. Score! For our first and last days our mode of transportation was foot. Between those days I spent 16,000 pesos on a bike rental for 2 days, and 15,000 pesos for a car rental for 1 day. Because the island was so small, (and also because the gas gauge was broken) we only put in 5,000 pesos (~7.60) for gas. Total cost of transportation for 3 days: 32,666 pesos (~$50). Expect to spend a lot more if you drink or want to buy souvenirs. Avoiding alcohol and shopping saves me a lot of money. I spent a couple of bucks on a postcard and a magnet, but other than that, I didn’t blow any money on shopping. We would have liked to go scuba diving, but it was too windy during our entire stay. The monstrous waves and white caps made each scuba shop turn divers away. Had we scuba dived, each dive would have cost anywhere from $50-$60. Excluding airfare, I spent a total of around $185 for accommodation, food, and transportation for 5 days on one of the most remote places in the world. In order to maintain this low of a budget, it is necessary to have a fondness for camping, patience and desire to cook, and good health to hike and cycle the island. If you require nice lodging, enjoy eating and drinking out every lunch and dinner, and only explore the island by tour or car, then the trip will cost you hundreds if not thousands of dollars. Even if you cannot bring the total cost down to under $1,000 like I was able to, the trip to Easter Island is worth every penny. I truly had no idea how beautiful the island was outside of the famous Moai statues. In addition to spectating some of the most iconic statues in the world, we were awestruck by the extinct volcanoes, incredible hikes and bike rides, caves, lava rocks and tunnels, and beaches. During my stay in Easter Island I recalled the pushing and shoving of the rude crowds at Angkor Wat in Cambodia, or even the national parks of Utah. That doesn’t happen in Easter Island. 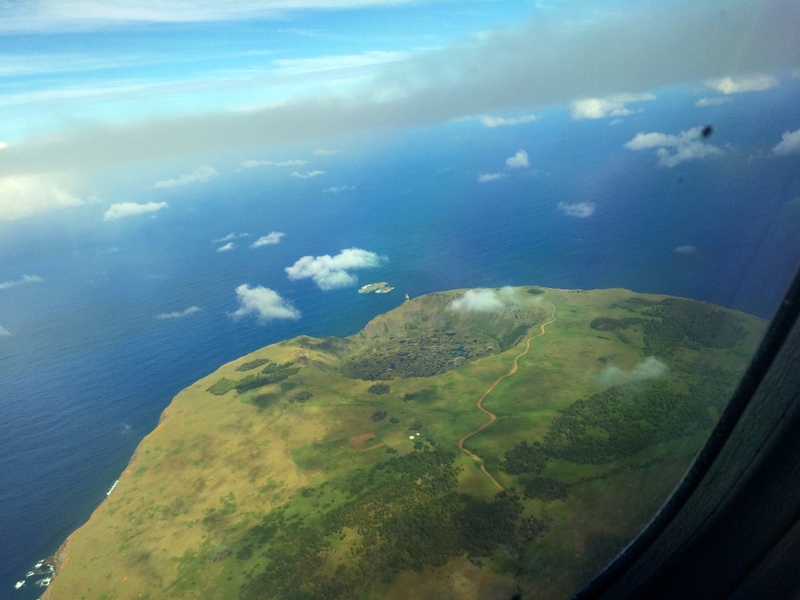 Public buses and franchises are even forbidden on the island for it is seen as destructible to the Rapa Nui culture. Anyone can enjoy the beauty of the island in peace, and anyone with a passion for the outdoors will easily fall in love with the island. Chris and I cannot wait to come back. This entry was posted in Chile and tagged easter island. Bookmark the permalink.